There may be unmarked spoilers in articles and trope entries for the series. You Have Been Warned! "Are you the prey? No, we are the hunters!" "That day, the human race remembered: the terror of being dominated by them, and the shame of being held captive in a birdcage." For more than a hundred years, the last remnants of humanity have lived in a kingdom surrounded by walls designed to protect them from a powerful race of man-eating giants known as Titans. The two races have locked one another into a stalemate: the Titans cannot breach the walls, and humanity cannot venture outside the walls without risking heavy losses. Those facts held true until the day a colossal Titan smashed a hole in the perimeter wall of the southern village of Shiganshina, which allowed its smaller kin to wander inside and wreak havoc. Among those who escaped from the ensuing massacre were three children: Eren Yeager, an aggressive adolescent boy; Mikasa Ackerman, his quiet adoptive sister; and Armin Arlert, Eren's bookish best friend. Years later, the trio decide to join the Survey Corps, a military branch dedicated to making excursions into the outside world to fight the Titans, and research ways to defeat them once and for all — and Eren, with vengeful and murderous intent in his heart, vows to kill every last Titan on Earth. 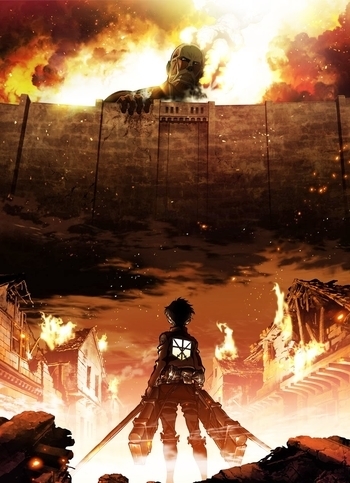 In addition to the action of Attack on Titannote 進撃の巨人, Shingeki no Kyojin, lit. "Advancing Giants", author Hajime Isayama also weaves a tight story around its large cast of characters and the strange, apocalyptic world in which they live. Titan also revolves around the concept of failure: the human forces repeatedly struggle to accomplish anything, sacrifice numerous lives, and make major mistakes to have it all come to naught in the end. But every so often, humanity's persistence, wits, and luck manages to pay off—and through their victories, a complex portrait of the world begins to form, one that reveals something more sinister to the weirder aspects of their world. Titan primarily explores the ways in which people deal with trauma, survival, loss, and death...as they fight man-eating giants. One can describe it as Neon Genesis Evangelion without giant robots and with a lot less angst (plus a protagonist who's the exact opposite of a Shrinking Violet - with all the good and ill that entails). From its relatively modest beginning, the manga managed to become the 11th-highest seller of all time in 2011. After the premiere of the anime adaptation (which became exceptionally popular in its own right), sales of the manga boosted exponentially, which has made Titan the most popular new anime/manga and surpassing many established franchises. The manga consistently sold in the top two every month and new volumes are being surpassed only by a certain best selling manga of all time and still growing. The success of both anime and manga launched a franchise ranging from video games to light novels to fragrances and coffee mugs. Plans arose for a live-action film adaptation planned for a 2014 release, and after a bout of Creative Differences between the director and the screenwriter (amongst other issues), the film had a 2015 release in two parts. Bloody Monday star Haruma Miura plays the lead role of Eren, while model-turned-actress Kiko Mizuhara (Mikasa), Kanata Hongo (Armin), Satomi Ishihara (Hanji), Nanami Sakuraba (Sasha), and Takahiro Miura (Jean) round out the main cast. In early 2017 , it would be revealed that Warner Bros. were in negotiations to create another adaptation, with one of the key producers behind Fantastic Beasts and Where to Find Them set to handle the project, and Andy Muschietti currently attached to direct. The anime adaptation of the series premiered on the 5th of April 2013. Yasuko Kobayashi served as head screenwriter, Tetsurō Araki as director and later chief director for the second season, and Hiroyuki Sawano composed the series' music. Viewers living in the United States, Canada, United Kingdom, and Ireland may watch the anime legally at Crunchyroll and Hulu; as of 30 October 2013, they can also read the manga on Crunchyroll. Funimation (which licensed the show for the United States) also streams the show, along the usual lines of subscribers getting it first and free viewers gaining the opportunity to watch it later. In Australia and New Zealand, Madman Entertainment has the series available for viewing on Anime Lab. For television broadcasts, Toonami aired the dubbed version in the United States, as part of its rotating schedule (and has done so since May 2014). In Australia, SBS 2 began airing Titan in Japanese with English subs as of September 2014. And just in case you really don't like any of those options, there's always Netflix. This series has several Character Sheets and a drinking game. A fan-made tribute game also exists, as does an individual trope page for the game. Now with a Recap page Here. For a full list of other works in this universe, please see Franchise.Attack On Titan. Don't confuse Attack on Titan with Giant Killing or I Kill Giants. Fans frequently shorten the Japanese title (Shingeki no Kyojin) to SNK, though the series has nothing to do with that SNK. Speaking of confusing acronyms, don't confuse this AOT with Age of Time. Please move any character tropes to the Attack on Titan character page and move any specific chapter/episode tropes to the recap pages. On that day, TV Tropes received a grim reminder: we lived in fear of the Tropes and were disgraced to live in these cages we called folders. "O, my friend! This here is a victory. This is our first honor. O, my friend! Let us celebrate this victory until the next fight!"